Another lovely London crafting blog this week - East London's Craft Guerilla who are entertaining London with their 'crafternoons' as well as being featured in the awesomely named 'Craftwerk 2.0' exhibition in Sweden. Craft, community, place to share and publicise: our events, members, designer makers and friends! It's a great way to showcase what we're doing as a collective. The huge amount of great,generous people in the craft community! It's a big city but you find niches of really interesting communities like the craft community that actually want to share, be part of something ethical and make their own things. What's your favourite London crafting moment to date that you've blogged about? It has to be our Craftea Party! Though we didn't get any photos - it was so busy that we didn't manage to take any - it was a joy to do because it was part of a local community art event, the E17 Art Trail which happens once a year in September. We had close to 300 visitors in two hours. There was a lot of cake, tea and craft making! How would you advise people to get into the craft scene in London? It's no longer a past-time just for nanas. There are lots of craft groups meeting and making through out London. Actually there are many all over the country, we have two other Craft Guerrillas in the UK: Brighton and Edinburgh. We are the original group that brought D.I.Y. 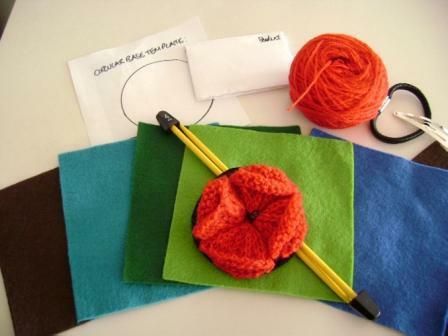 craft packs to our nights because we wanted it to be as simple as possible and not scary especially for beginners.There are a few "free form" craft nights which is great but we want people to go away with the knowledge and learning of a skill. Also for people that are not confident enough having something ready to follow is a great introduction to craft. But if you want to start your own go for it! The amount of creative, friendly people you meet is awesome. Start with a few friends get together in a pub, take a few projects and just enjoy yourself. Knitting always gets people talking and interested in what you're doing. You'll soon get lots of curious looks from other pub goers and you might even pick up a newbie or two...then hey presto, you have a group! Would you feel less connected to London, or missed out on things without your blog? Not really. The amount of stuff going on is amazing and actually there are still a few publications like Time Out which are a great help in finding things to do. The aspect that I would miss out on is meeting people that probably I would have never crossed paths with because London is so huge. How has your blog connected you to another community of bloggers in London? The world? We've made many friends not just in London but from all over the UK, Sweden, Portugal, Scotland, Australia to the US. It's been really interesting, all kinds of things have happened since and because of it like when we were picked up by an exhibition curator in Sweden and we're now part of the exhibition Craftwerk 2.0. in the Jonkoping County Museum which runs until January 2010. I quite like Wee Birdy, Soupa, Amelia's Magazine and Qype is pretty good too. I live in Walthamstow East London. I don't know about loving it but it can be quite homely at times. It's a great place to buy fabric and trims. Where's your favourite place in London? The Serpentine, Hyde Park. Absolutely beautiful anytime of the year! What do you know about London no one else does? I'm sure it's a well know fact that Londoners are very helpful; be they celebrities or civilians. It's not a secret but it's sometimes forgotten just how true it is. Tourists have the preconception that we're pretty unfriendly and grumpy. Not everyone sends you off in the wrong direction just for a laugh! Not yet. Is that something I should aspire to? We have a corker of a November Crafternoon coming up! Saturday the 14th at the Old Queen's Head in Islington from 2pm to 5pm. It's our count down to Christmas featuring Mrs. Bears with her swishing and Make do & mend corner, guest DJ's and we'll be teaching people how to make their own Xmas gifts part of our "Buy Less Make More" event. Also its about getting ready for the holidays. Swap your unwanted goodies for a new outfit. A new frock with minimum spending, recycling and up cycing! Apart from that we hold all sorts of great creative offerings: monthly Crafternoons, Craft Markets, Work shops ("Classes for the Masses") and D.I.Y. Craft Nights.